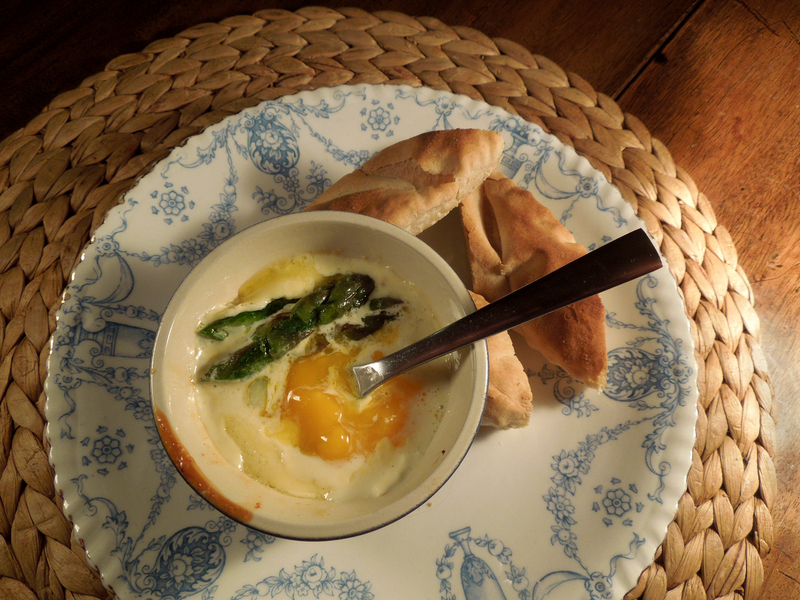 Like most things, this sounds more glamorous in French – oeufs en cocotte aux pointes d’asperges. But it tastes great in any language. 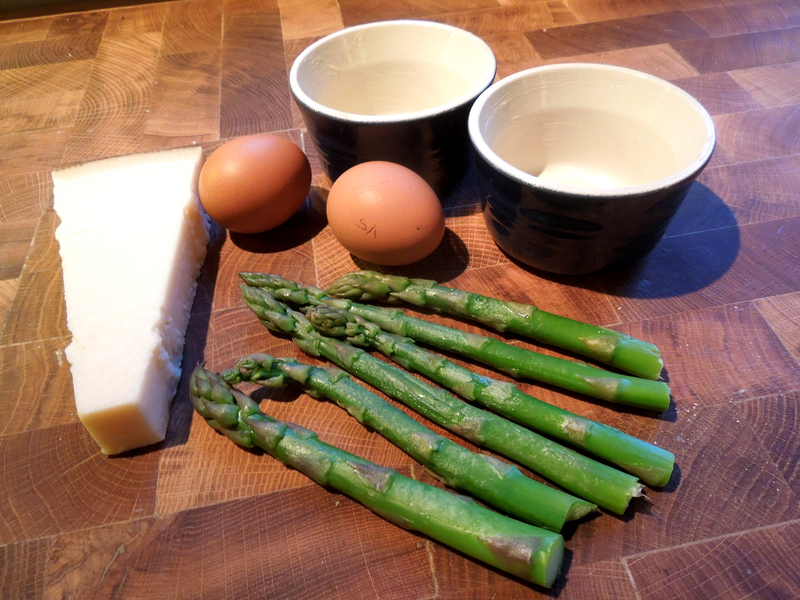 I’ve added a touch of parmesan as it goes so well with both eggs and asparagus. This is a quick, easy but utterly sybaritic starter or light lunch and a properly seasonal dish for National Vegetarian Week. Try it with a good crusty bread to sop up all the egg yolk and sauce. Steam the asparagus until it’s tender but still has a little bite – it shouldn’t be floppy. Mine took five minutes. Cut the stems into small chunks and divide them between the ramekins, reserving the tips for later. Grate the Parmesan and mix with the cream or crème fraîche, seasoning with salt and freshly ground black pepper. 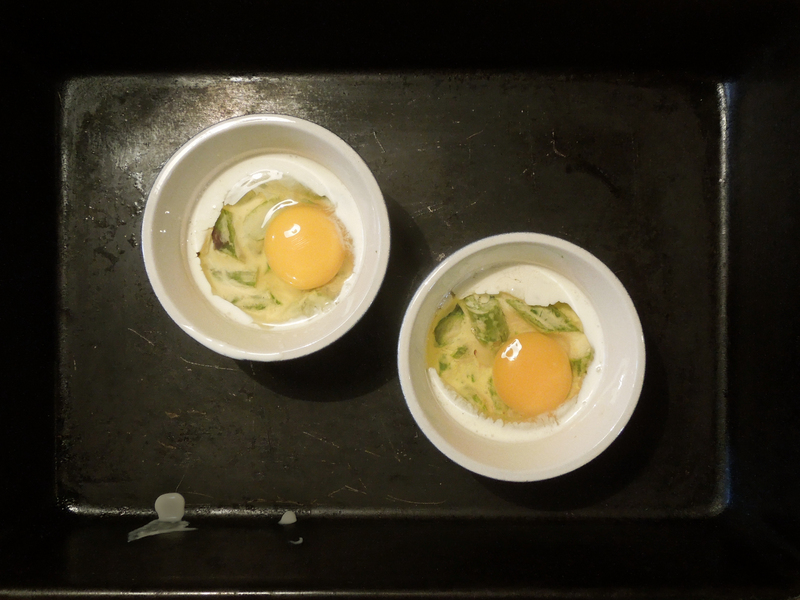 Put about two tablespoons of the mixture in the bottom of each ramekin and break an egg on top. Spoon a couple more tablespoons of cream over the top. Put the ramekins in a roasting tin and fill the tin with hot water to come halfway up the pots. Put in the pre-heated oven and cook for about 15 minutes or until the eggs are set to your liking. The yolks should still be runny so bear in mind that they’ll continue cooking in their own heat. You don’t want hard-boiled eggs in cream. Melt a smidgen of butter in a pan, put in the tips and reheat gently. Place the tips on the tops (it’s a tip-top dish) and serve straight away with crusty baguette. 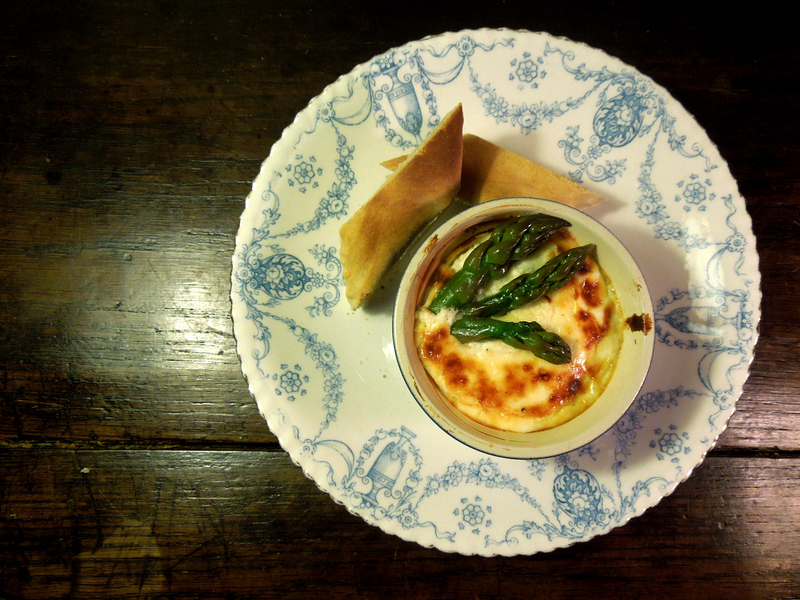 This entry was posted in Eggs and dairy, Soups, starters and canapes, Vegetarian and tagged asparagus recipes, egg recipes, Eggs in pots with asparagus, National Vegetarian Week, oeufs en cocotte aux pointes d'asperge by Linda Duffin. Bookmark the permalink. The idea of National Vegetarian Week is as daft as the recipe looks great. I’m conflicted! Thanks. Not perhaps as daft as the fact that it’s also National Tomato Week here. I know commercial growers can produce them under glass but our home-grown toms are still little more than seedlings.